Nowadays you can watch a traditional Amish barn-raising on Youtube. You'll see the huge crews, in a coordinated effort resembling a well-choreographed dance, hoist the pre-constructed components into place with outstanding efficiency, completing even the most massive of structures in just a few days. Farm owners who have ever considered building or restoring a barn know of the reputation of the Amish for quality workmanship as well as speedy assembly, so it should come as no surprise that the builder hired to reconstruct a landmark here in Loudoun County lost to fire last year is an Amish builder with 27 years of experience: Groffdale Barns from Lancaster County, Pennsylvania. 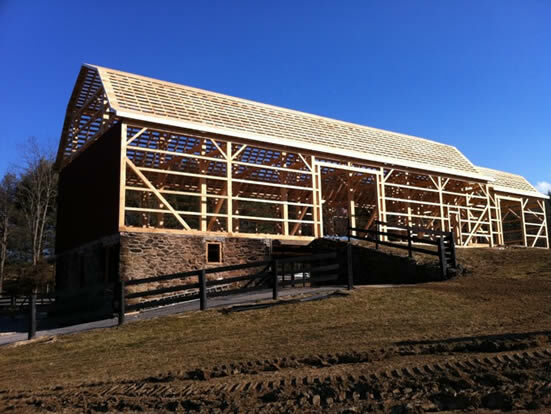 When the Civil War-era bank barn on St. Louis Road in Middleburg was struck by lightning and burned to the ground late one fall nite in 2010, tragedy became an opportunity for the owner to rebuild the barn in its original glory, with a few invisible touches that improve on the original. The most significant, according to Moses Riehl, owner of Groffdale, is that the floor was made significantly stronger to allow the owner to drive a truck and tractor into the barn from the bank side. "There are some steel beams hidden in there. We used oak floor joists four inches thick and eight inches high, placed every 16 inches," Riehl explains. Then two-inch by eight-inch tongue in grooves barn planking was laid down. "The stronger floor is the upgrade that everyone wants in these old bank barns," says Riehl. Groffdale is known for its ability to restore old barns and build new barns that look like they were built 150 years ago. In the barn on St. Louis Road, Groffdale used mortise and tenon joints with wood pins, a construction technique thousands of years old. However, only twenty miles to the north, in Pasonian Springs, Virginia, Groffdale built a barn last year using a material developed 30 years ago - Hardie Board. Horse Owner Julie Harris had decided to hire Groffdale to build her four stall barn, after looking at another barn they built and comparing Groffdale's prices with a traditional on-site builder. "I was very impressed with the level of customization they offered for the price," says Harris, "And Moses was very open to my ideas," she adds. Among those ideas was the desire to use Hardie Board - a fiber-cement siding - to cover the outside of the barn instead of using wood. "Hardie-Board turned out to be the same price as wood," according to Harris. It doesn't need painting, is impervious to moisture, and lasts longer. "It also went up easily - it was neat and straight and easy to cut," she says. Like the barn on St. Louis Road, Harris' barn was trucked down from Pennsylvania in pieces. The crew that came to erect it worked fast, impressing Harris, especially since she was paying for the assembly by the hour. When asked what sets his company apart from other barn builders, Moses Riehl says it's their work ethic. "We give people a good fair deal," he states simply. Riehl's enthusiasm for what he does is also apparent in a conversation about his projects. 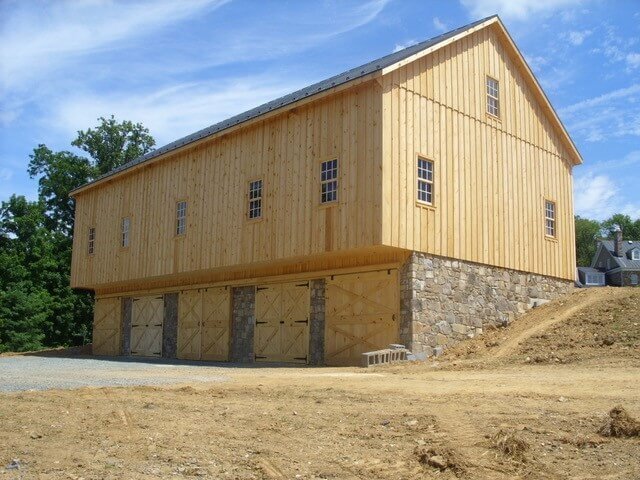 "We just really like building barns," he says. "I get excited about building a barn that I can imagine my great-grandfather would walk by and say 'Look at that nice barn there.'" While Groffdale does use some modern tools such as electric saws and cranes in constructing their barns, Riehl's great-grandfather would certainly approve of the final product.